Importance Note: This book exclusively sell only on Amazon.com and Createspace.com. We have no any re-seller and have no any re-seller price. Please kindly help to buy my book from Amazon.com to stop the pirate.Thank you very much for your support. Wish you are happy and very enjoy. Cherina Kohey. : ) Coloring time is calming time! if you love my top 20 best seller book on Amazon "Flowers and Butterfies," you will love this books for sure. This is my proudly present special very new coloring book. It's perfect gift for anyone you love and care.It can make happy relax and joy time for everyone. 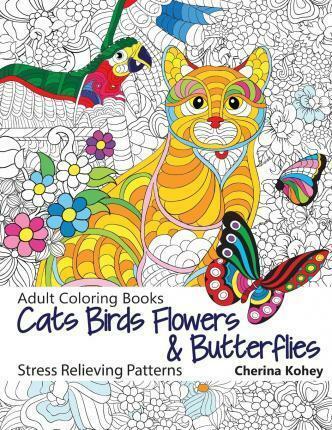 The "Cats Birds Flowers and Butterflies" has present the special design of the most popular item for coloring. You will found 30 designs of different dimension of cats birds flowers and butterflies such as cute cat, art bird, creative butterflies, graphic precious flowers and etc . Range in complexity from beginner to expert-level. Let's join millions of adults all around the world who are rediscovering the simple relaxation and joy of coloring!. Please enjoys! !